Despite the insurmountable odds, harsh discipline or unbearable circumstances British soldiers were occasionally driven to the desperate act of deserting into the vast colonial wilderness. There are accounts recorded from as early as the 18th Century. 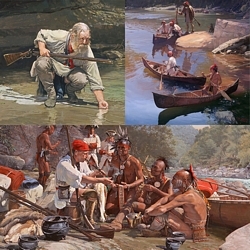 To help capture these run-a-ways during the French and Indian War, the use of allied Indians began in earnest after 1760. I have sent under the care of the bearer, Corporal Roller, Phillip Dill of Major Walters Company, who deserted from Niagara the 12th of July & was brought here by an Indian who took him up near Custaloga's; as the Indian insisted much to have his reward in Rum, I promised that he should have 2 1/2 gallons at Fort Pitt (where he will be in a few days) in case you approve of it. The Deserter says there was another man came off with him, whom he left in the woods near Presqu'isle so weak that he could not proceed & that he advised him to deliver himself up at Presqu'isle . . . ."
"Lost and Found for Bounty" is a Fine Art Canvas that captures John Buxton’s incredible play of light in a dark forest coupled with raw, intense emotion. No one captures light and or stages a scene in a painting as skillfully as Buxton and few other painters pay such attention to historic detail.